No one needs to sell rosehip oil benefits to me, this is possibly my all time favourite product. This is one of those those random products that I still remember where and why I bought it, despite it being years ago. All it took was Miranda Kerr saying that she uses a few drops of this to keep her skin lovely and I was in Boots quicker than you can say ‘where is the ‘make me look like a Victoria’s Secret model’ aisle?’. I tried it and by the next morning I was hooked. In truth, I’ve never tried a brand other than Trilogy, just because I know and trust them and there aren’t that many brands readily available in shops in the UK. Reducing redness was the first thing I noticed. I have oily skin, which is mildly sensitive after years of being attacked with anti-acne products. This means that it’s prone to redness, which can be triggered just from touching it (and weather, wine, temperature, food, products…). Waking up the morning after using this rosehip oil, I immediately noticed that my skin was distinctly happier, calmer and less red. Alongside this calmness in my skin, I love how it manages to tackle dry skin. I will occasionally get dry patches, although usually it’s only when British weather gets particularly shocking. I always trust a couple of extra drops of rosehip oil to moisturise my skin really well. If I’m feeling particularly lazy after cleansing my skin, I just apply a few drops of this and roll into bed and you would never know that I’d skipped my normal moisturiser the next day. Scar reduction is the area which is probably the most difficult for me to back up the benefits of this oil. Any facial scarring that I still have tends to be light dimpling in my skin as opposed to red or dark marks, so it’s hard for me to assess whether the oil effectively reduces scarring. I have noticed that my skin recovers well from breakouts though, which I’ll happily attribute to this oil keeping my skin happy (is describing skin as happy a thing? It just feels happy!). I use rosehip oil by adding three drops onto my finger tips and tapping them all over my face, so a little goes a long way. I primarily use it at night, but sometimes I’ll use it under my moisturiser in the morning if my skin is looking particularly sorry for itself. I have oily skin and this sinks in without a problem if I leave it for a couple of minutes. 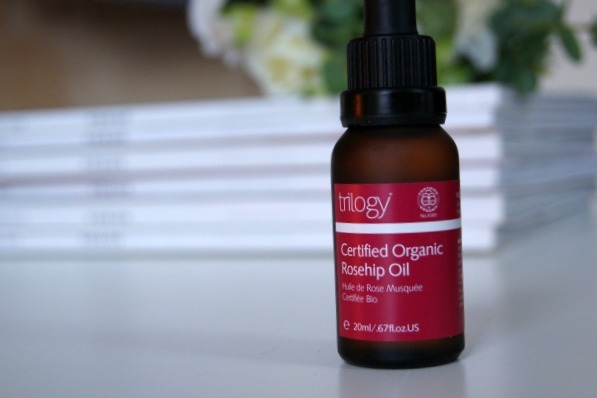 Finally, I thought it was worth paying attention to what Trilogy say their rosehip oil can do, so here’s the science bit. This rosehip oil is also pure and organic so it is packed with goodness and you can trust it doesn’t have any of the nasties that seem to swamp so many normal beauty products. All in all, I am besotted with this oil and highly recommend it. 45ml of this oil is available for £28.50 or 20ml for £16.50. As always, I love your comments and would love to know if you have a favourite face oil. Or have you tried this one?